"No one in the history of the world has ever self-identified as a pseudoscientist. There is no person who wakes up in the morning and thinks to himself - I’ll just head into my pseudolaboratory and perform some pseudoexperiments to try to confirm my pseudotheories with pseudofacts". And this is the ultimate truth - there is no pseudoscience. It's not the real thing. You can, with more or less enthusiasm, add adjective "pseudo" to anything you like and get yourself the bad or opposite meaning of the original word. But in the world we are currently living in and with, for example, TV shows like "Ancient Aliens" being vastly popular than attending lectures or reading published scientific papers by professional archaeologists and historians, pseudo combined with science are now recognized word in almost all thesaurus and dictionaries. It definitely earned itself to be the real thing after all. But if there are no pseudoscientists proving their pseudotheories, how exactly it became real in the first place? Surely popular documentaries such as "Ancient Aliens" or books like "Göbekli Tepe: Genesis of the Gods" with both of them treating religious texts as undeniable facts are coining the word more and more with every repeating broadcast and amazon purchase. 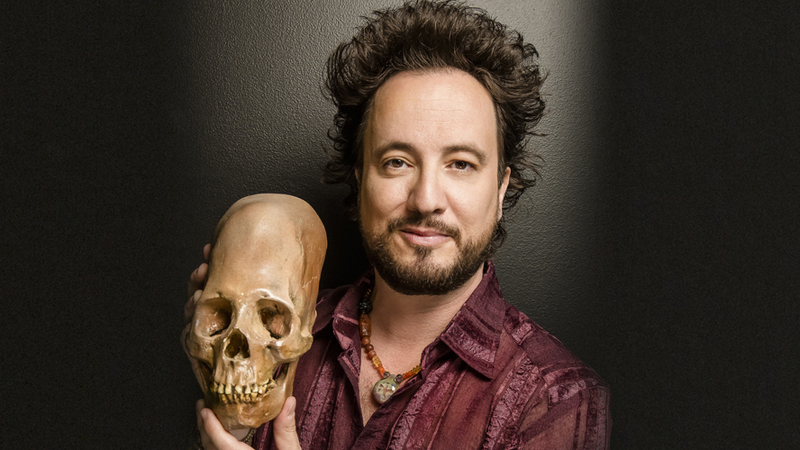 However, we cannot put entire blame on Giorgio Tsoukalos who is definitely one of the faces we think first of as a metaphor of the entire background behind the pseudo-scientific world. Don't get me wrong here - I do enjoy watching Giorgio and History channel is pretty high in my cable list and I even own a book or two with intriguing titles connected to Nazca lines and elongated skulls (like the one in Giorgio's hands in below image) written by Erich von Däniken, but even though I dislike pseudoscience per se, I genuinely don't look to the entire 'genre' too critically and by the end of this post I will even give it a credit for helping main scientific stream even more than modest scientists are ready to admit. So, in relation to science, how 'pseudo' can contribute at all? But first we need to better understand how the science mainstream works in the first place. Basically if you take Gordin's quote from the beginning of this post, change the meaning a little, following by excluding all 'pseudo' words - it could be the shortest valuable definition. In addition, what scientific mainstream does, is to identify and adopt new idea and spread it to the scientific society. If the idea passes the challenge, it gets itself a research by various independent scientific groups and at the end, after numerous publications, debates and with additional new inquiries, if proven worthwhile, it receives its own theory. After that point and over time it is all about proving or discarding it in experiments and observation. No matter what happens in the end, the entire process from the idea till the new knowledge is what we recognize as scientific process. Even in the potential case of acquiring some fabulous artifact or tool (i.e. anti-gravity engine) that originates from the aliens, science would take it apart and in the process of reverse engineering, disassemble to the basic components and tried to understand it fully before putting it into mass production. Pseudo world in scientific realm comes to the 'new idea' part. And you can get ideas from anywhere and those believable and fabricated from the old history could be very hard to scientifically pursuit but they are sometimes, if not always, very appealing and interesting. For example it is easy to say that some poorly cartooned image by some cave-man artist resembles more to astrosuit than some old civilization outfit created for their spiritual ritual, but in fact, this kind of statements or ideas not really contribute to the mainstream with actual new knowledge and they are often based on myths and questionable ancient (and not so ancient) stories. But they are very believable, entertaining and, who knows, maybe some of them are not far from the truth nevertheless. However, in the end, they are just good stories and nothing more. Furthermore, if you ask me, this conclusion might be very true for all dogmatic and religious beliefs even today, considering that they are all based on ancient texts that are taken for granted as the ultimate truth and interpreted in one way or another. To prove the point, perhaps two epic masterpieces from the old ages, more than others, inspired many conspiracy theorists and writer(s) of the most famous religious book(s) today. They are "Epic of Gilgamesh" of ancient Mesopotamia and ancient Indian Sanskrit called "Mahabharata". Both of them are mixture of fiction, true stories from the time, history facts and inspirational/motivational material with strong messages for their readers (for their time) along with religious and/or spiritual aspect spread throughout the poems. It is easy, for example, to find numerous similarities of people and events in four millennium old clay tablets* and those described in "Book of Genesis" or "Old Testament" as we know them today. But there are other ideas that walks on the edge of being pseudo but with potential to change our understanding of the world and the universe. Let me give you two examples. Well, first example is more a set of bold ideas originated from the scientific world and scientists themselves. They are people like all the others and they are allowed to daydream even more then others. Today, there are many of their new ideas that passed the initial process and ended with theories that are well documented, published and backed with heavy usage of mathematics and physics formulas and equations. But, like any pseudo-claim they also have one thing in common - it is extremely hard or even impossible to prove them or confirm them in experiments. Let me just enumerate several in the realm of astrophysics: String theories, Hawking radiation, Multiverse theory, Holographic principle, Zero-Point energy and Vacuum fluctuation, Warp drive and Wormhole theory, Quantum entanglement and teleportation, etc. I am not saying that all these ideas are the same as pseudotheories but they are all stuck in the same space of unproven bag of ideas still waiting for a meaning or new technologies or any other kind of breakthroughs in order to be validated and recognized as a new knowledge. Second example is what we safely say it's a pseudo-idea and here is the good place to quote myself from an earlier post regarding human soul and consciousness research** "At the end, proving that we all are living in a universe where one single individual is only a single link in the big chain of one ultimate consciousness along with the claims that our mind is capable of interacting with other's and also with material world, is going to be very hard with all we know today. For example, is not far from logic to assume that one mutual consciousness is stronger around our planet where seven billions of people breath every second and weaker with distance especially in the distant areas of the Solar system where no life exists. However, to prove or dismiss this idea, we need to put somebody in spacecraft and send him beyond the Oort cloud or even farther to the very edge of the Solar system and measure both subjective and objective consequences with astronaut so far away from the hive called Earth." Obviously we are still far away from performing experiments like this or to find a black hole and put a space ship in its orbit in order to detect Hawking radiation. But it was more or less the same with Einstein and his theories of relativity that waited years for both mankind and technology to mature enough in order to be confirmed. And eventually it happened nevertheless. The same could be true with pseudo-claims. Even if they serve today just to entertain us in documentaries, books or movies and even though they are not based on any solid ground one day we might give them that solid foundation and be ready to put them into validation process. And I wouldn't be surprised if some or many of them became proven and true. But what about conspiracies? Can we give them the same amount of credit like with pseudotheories? Can we really be so sure that they are possible? Like all those portrayed in movies and literature with governments, big corporations or religious headquarters having secrets so big and dangerous we are all unaware of? Well, my open-minded-skeptic personality stops right there.. I really think there is no such thing in the world. Claims that governments already contacted alien intelligence or Vatican to have secret basement with off-the-world or divine artifacts or large corporations to perform experiments with futuristic technologies nobody knows about - all that walks to the edge of impossibility to me. In this case I will simply follow my philosophy "to not believe in concept of believing" and say that I will start 'believing' with a conspiracy when I see one with my own eyes. 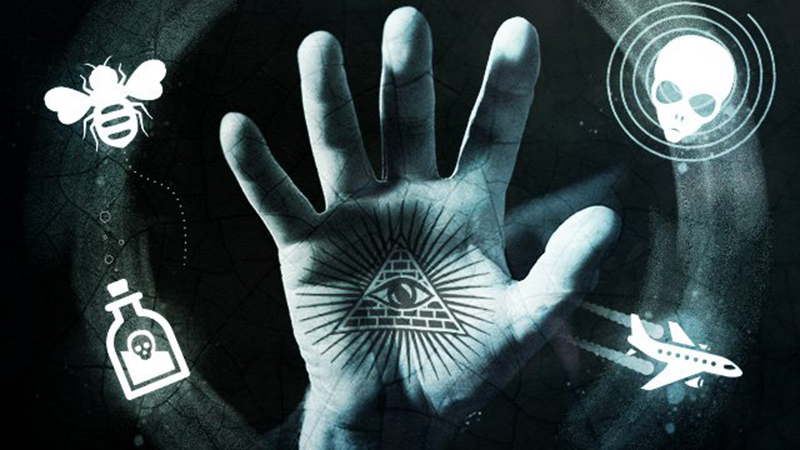 However, and if we stay in the world of entertainment, conspiracies are very high in my reading and watching list. It's hard to explain why. I simply love the mystery and possibility that there is something out there, something extraordinary and new. Something that only lives in fiction. 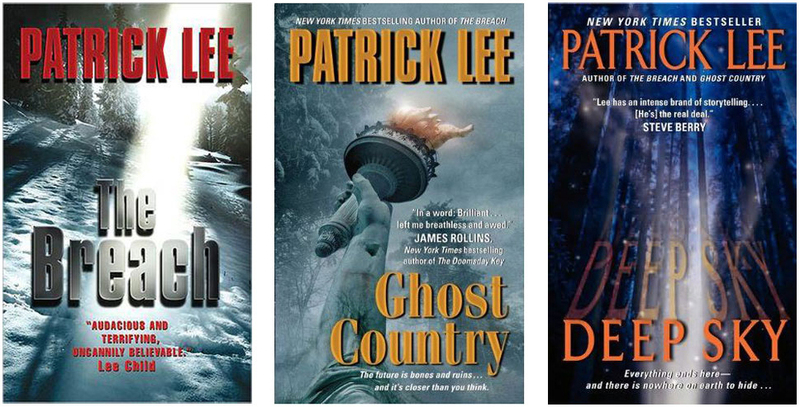 And for today's glimpse into this world I chose to show you one extraordinary novel series, written by Patrick Lee and called "The Breach". After I have read all three books with Travis Chase in lead role I can tell you that if you enjoy 'conspiracies' genre this is standing shoulder to shoulder with Fox Mulder. And not just conspiracies. Sci-Fi part, all the twists and storytelling is something I was never encountering often with other authors so far. Perhaps the same value is with A.G.Riddle's "The Origin Mystery" series of novels. With both of them, everything was perfectly wrapped and almost unpredictable to the very end. Something I am secretly hoping with any book I start to read. I admire both authors for the imagination they have and willing to transform into letters. I can't thank them enough for entertainment I had for weeks.